Posted on April 16, 2014 by Jeremy Cole. This entry was posted in InnoDB, MySQL. Bookmark the permalink. I’m learning InnoDB, and the description of internal data structures are invaluable.. Thanks very much! 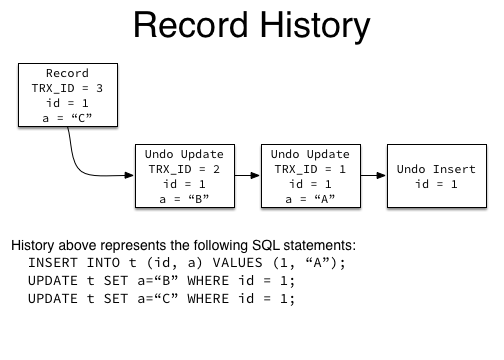 Hi Jeremy, is there a way to implement the “row version” in Mysql as SQLServer does. Say if we insert or update the table, the new or changed rows’ version increase, so that we can get the incremental data since last. Yes we are using InnoDB. Great article, it helps a lot when I try to figure out MVCC of MySQL.